We’ve moved to CO and are doing our best to settle in. We brought enough of our kitchen so that some simple dinners could keep happening in the month we’ll be waiting for our things. 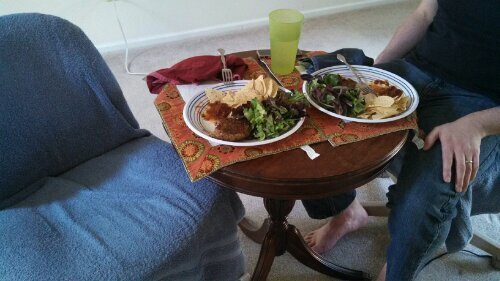 In true form, we found a way to have dinner in the dining room (who needs a table?) in front of the TV. 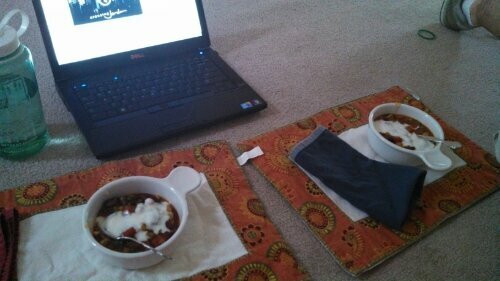 We made Smitten Kitchen’s kidney bean curry and settled in to some Crossing Jordan. The table situation has since improved when movers surprised us with a partial delivery (that included our bed, thank goodness). Pair an end table with some $5 thrift store office chairs (the towels hide the non removable grime) and it’s back to normal dinners at the White house.